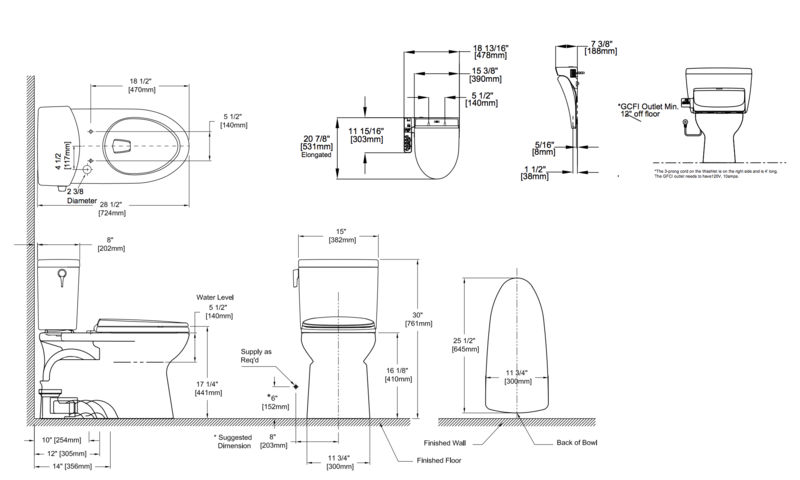 TOTO’s Vespin II 1G Toilet features a sleek, contemporary design along with an efficient, yet powerful, 1.0 gallon flush. The toilet also comes with TOTO’s forceful Tornado Flush System, and this, in combination with the high tech CeFiONtect glaze coating the bowl and the C100 Washlet+’s premist feature, discourage residue from clinging to the toilet. As an extra bonus, the Vespin II 1G toilet has been specially designed to hide the C100 Washlet+’s water and electrical connections from view for a streamlined look. The C100 Washlet+ provides three wash modes (front, rear and soft rear) and adjustable water temperature, water pressure and wand position for a fully customized, ultra-comfortable cleanse. The heated seat is designed to keep your tush warm on even the chilliest morning, and the oscillating spray option causes the bidet wand to move back and forth during the wash cycle for even greater cleansing coverage and a soothing sensation. The tank water heating system provides a limited amount of warm wash water, and if the unit is used several times in a row or if you run a long wash cycle, the warm water may run out. If this happens, the C100 switches to using cool water for washing until the tank can refill and reheat, a process that typically takes a few minutes. The C100 Washlet+ also comes with a warm air dryer with adjustable temperature settings, and this is an especially nice feature to have if you prefer to avoid using toilet paper to dry yourself due to physical limitations or painful bowel conditions. The seat’s automatic deodorizer helps destroy unpleasant bathroom odors at the source, and the energy saving mode conserves electricity when the seat is not in use. Do keep in mind that the C100's controls are located on a panel attached to the side of the seat, and remember that this particular model is only compatible with Washlet+ toilets. If you’re looking to change your bathroom routine for the better, the Vespin II 1G Washlet+ C100 Two-Piece Toilet and Bidet System is a great place to start!